Love is a dark and twisted thing. We all know this but it’s never really put on the canvas in a way of appreciation. Kanye West was able to deliver a stark and unrelentless tone in his album MY BEAUTIFUL DARK AND TWISTED FANTASY. If one was to describe the latest film from Guillermo Del Toro’s CRIMSON PEAK they may look at it in the same manner and the words penned in West’s title would resonate. Maybe take out fantasy and insert fairytale as PEAK brings a gothic styled fable to light under a shadow of insanity and indecency. As the reviews roll in you will consistently hear the words beautiful and visually stunning to describe the film which is spot on and accurate. Another thing that you may hear from fans and critics is the storyline and concept are a little slow and purging. That happens to be the case as well but in my opinion what CRIMSON PEAK does provide is it’s own point of madness dealing with a taboo topic that has existed for some time. In the film we find the young and ambitious Edith Cushing (Mia Wasikowska). She’s an aspiring writer who would rather be compared to the likes of Mary Shelley as opposed to Jane Austen. While fighting for equality with her writing she meets Thomas Sharpe(Tom Hiddleston) an English inventor who is looking for backer for his latest creation. He immediately takes an interest in the Edith which sparks the attention of not only the community but the cold and ever so watching sister of Thomas, Lucille(Jessica Chastain). Edith’s dear friend Dr. Alan Michael (Charlie Hunnam) and father are weary of the brother and sister and when a secret is exposed they are asked to return back to England. For Edith tragedy would come and the only comfort she can find is in the arms of her new love and returns to their gritty and heartless manner to begin anew. 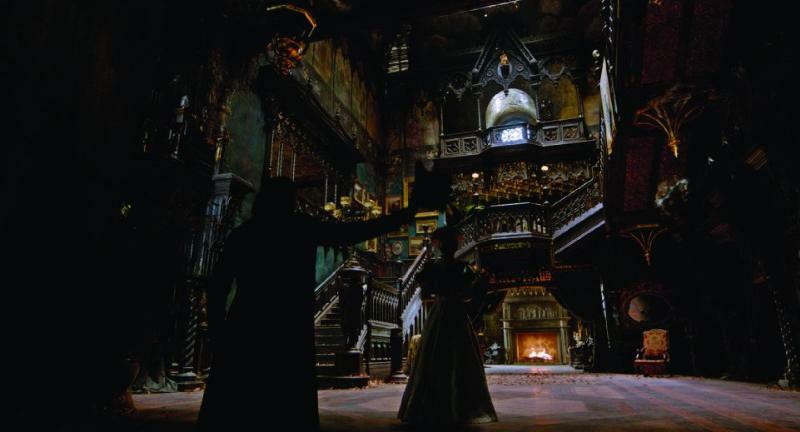 CRIMSON PEAK is remarkable in regards to aesthetics so for fans of Del Toro this will be a treat. Though once passed the eye test we find a story of lies, deceit and insanity that isn’t new to an audience but takes a while to ingest. It’s almost comical that Edith’s father is played by Jim Beaver as the supernatural aspect of the film is your typical “is the ghost trying to kill me or warn me” scenario. This slow burning epic will be hard on the active souls and when the climax arrives it’s a little off putting and undeserving. Each viewer of CRIMSON PEAK will bring something that they like and dislike to the table. While many reactions will be similar it’s hard to tell die hard horror fans that this is a film worth their time. Give Del Toro credit for jumping the gun and explaining that this film is not a horror movie because it truly isn’t. It’s a beautifully twisted dark fairy tale that maybe better suited for the small page than the big screen. Yet it is quite remarkable to see! CRIMSON PEAK is now playing in theaters everywhere. It is directed by Guillermo Del Toro and stars Mia Wasikowska, Jessica Chastain, Tom Hiddleston, Charlie Hunnam and Jim Beaver.